In the old days, long ago, when I first lived in Belgium, visitors to that tiny country were reminded that it is the home of surrealism a few minutes after they walked off the plane. 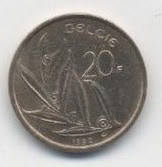 Arriving at the baggage control, they were informed in French and Dutch only, that they needed a 20 BF coin in order to release a baggage cart from its moorings. How many people do you think understood this, or even if they did, were in possession of what I later learnt to call een stuk van twintig/une piéce de vingt francs? The answer, of course, is the population of Belgium, plus all those who had travelled this way before and now always, always carried said coin with them. Before I embarked on this multi-country vacation I had made a plan to try and do all traveling in Europe, other than plane, by public transport - no cars, no taxis. So far I had caught a train from the airport in England, changed to the underground to reach my destination and repeated this to catch another plane to Belgium. It had been simple, inexpensive and eco-friendly. I had no qualms about continuing on the continent; Brussels has made enormous strides to link its airports with its train and bus service and the latter stopped just outside my hotel. Remember Belgium is my home, my adopted country, so I knew which bus to catch and that I would need the correct change for the bus. So after collecting my luggage I got into the elevator and headed down to the bus station. I had a wallet full of euros and stopped with note in hand in front of the new ticket machine. Huge signs let me know that by buying my ticket here in advance I would not only save time but also receive a 25% discount on the 4 euro ride into Brussels. Brilliant, I thought and looked for the correct slot in which to insert my five euro note. There was none. My folly was in assuming that I would be able to insert a five, ten or twenty euro note into the machine and get change and a ticket. The machine mocked me. Of course, this being Europe there are other ways to pay - with a credit or debit card - which I had. One of each. Unfortunately, this being super secure-no danger of card-or-identity theft Europe, I needed a smart card, a card with a chip inside so I could then type in a secret code known only to the bank and myself. My cards, being US issued, lack that security feature. (Heck, they don't even require matching signatures in America, do they? Go on. Try it. Sign your credit card receipt Mickey Mouse and see what happens. Nothing, right? Except the charge will appear undisputed on your next statement. Not exactly secure, is it? But I digress.) The machine mocked me again. It practically scolded me. I was undeterred. I returned to the arrivals area and looked for a change machine where I could get coins in exchange for notes. Of course they do not exist. Had I arrived at the train station in the centre of Brussels I could have bought a ticket with paper money at a Bootik from a real live salesperson. At the airport? Nada. I asked at the information desk where I might be able to perform such a transaction and was directed to the Bureau de Change, where I could of course change foreign currency into euros but not euro notes into euro coins. In the end I bought a packet of Tic Tacs for 85 cents which gave me the 4 euros to put into the ticket machine, which then happily dropped 1 euro in change into my hand along with my ticket. Success at last. I might have beaten the system but having spent the entire day traveling the last thing I needed to do was fight the transport system, or wheel my luggage those extra metres to and from the airport concourse a second time. Belgium had taught me once again that things are never as they seem at first glance nor as straightforward as I would like them to be. You have such patience! Also, this was a great post. Quand on le sait, c'est facile!